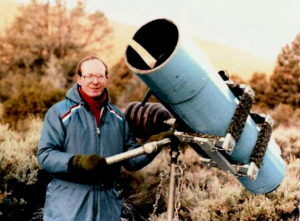 Don Machholz at the comet discovery site on the morning of the discovery. Now fully dressed, I opened up the back window of the camper shell and, leaving behind my sleeping wife Laura, I stepped out into the cold air. The moon was still up and casting light upon the landscape. Soon it would be setting, and I would begin searching for a new comet. This weekend had been a tiring but refreshing one at the Riverside Telescope Maker’s Conference at Camp Oakes, near Big Bear City in southern California. Over 1300 individuals had attended the Memorial Day Weekend gathering, held every year since 1969. Talk had been about telescopes, photography, computers, and Halley’s Comet, which most of us will be observing before the end of the year. I walked down the dirt road, known as “telescope alley,” and onto the telescope field. Many of the hundred telescopes were gone, their owners having already left or packed for an early getaway in a few hours. Those telescopes remaining were being put to good use, some searching for faint galaxies or nebulae, others being used to show heavenly wonders to friends. Many new friendships are made each year at the Conference, often under these dark skies, where faces are not seen and we learn to recognize the voice. Here is a place where astronomy is both enjoyed and shared. I turned and started walking back toward telescope alley; my telescope was set up near the end of the alley among the bushes on the right. The instrument is a reflecting type of telescope, it uses a mirror ten inches across which focuses at a distance of 38.2 inches, meaning a focal ratio of 3.82. This is a short ratio of focal length to mirror diameter but allows for a wide field of view. In this instance, however, I had placed a cardboard cutout in the eyepiece giving the field of view 1.6 degrees square. Telescopes usually have round fields, but I believe a square field has some advantages for comet hunting. The eyepiece gives a magnification of 32. While the optics were commercially made, the rest of the telescope is homemade. Its first construction took place in 1975, it was redesigned in July 1981. The complete optical system is now mounted on an alt-azimuth mount made of lead pipes. With this type of mount, I can scan (or sweep) parallel to the horizon. This allows for more efficient comet hunting since comets are often found near the horizon. Three years ago, at my first trip to Riverside, this telescope won the Warren Estes Award, given each year for a telescope made from simple materials. This year, I did not enter the telescope, I brought it only so that I could continue my comet seeking while on my four-day vacation. The comet discovery site, Southern California’s Camp Oaks. At 1:25 on this morning, May 27, 1985, I began comet hunting Session No. 1385. This started as any other, with anticipation and excitement, because I never know just what I will find while comet hunting. Two mornings ago I had picked up a very faint nebula which I had never seen before. My first sweep was at an altitude of about 45 degrees. My goal was to cover the eastern sky from the celestial equator to 40 degrees north. This required peering through the telescope as I pushed it northward to about 40 degrees north. During that time I would be looking for anything faint and fuzzy gliding through the field of view. Such an object could be a new comet; more often these would be clusters, nebulae, galaxies or small groups of faint stars. Nearly eight years before, on the morning of September 12, 1978, I uncovered an object which turned out to be a comet. Being newly discovered, it was named Comet Machholz, another designation being “1978L”. 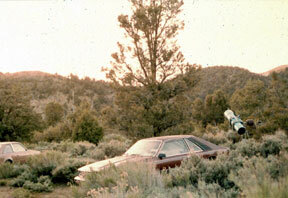 It was the twelfth comet recovered or discovered in 1978. That find, for which I used many parts of my present 10-inch telescope, had taken 1700 hours of searching over more than three and a half years. The comet was faint when found and did not get much brighter after discovery. I was able to observe it for one month before it disappeared below my southern horizon. It is a type of orbit by which it will never return. My first comet was found from a mountain called Loma Prieta, in the Santa Cruz Mountains, 22 minutes south of my home in San Jose. But this morning I am over 400 miles south of my home, at an elevation of 7700 feet. The telescopic views were great. I swept up the Veil Nebula in Cygnus with all its delicate beauty. I also saw a globular cluster named NGC 6740 and a wonderful open star cluster known as M11. With each sweep, I moved closer and closer to the horizon, which, ideally, I would reach just as the sky was beginning to brighten. 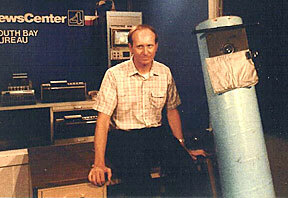 Don Machholz at the KRON Channel 4 studio. Shortly after 3:00 a.m. I stepped back from the telescope, removed my eye patch, put on my glasses and looked at the night sky. This was a perfect night for comet hunting. Being far from city lights, the stars and Milky Way stood out in high contrast to the dark background. Only under such conditions can astronomers carry out many of their programs. I commented to my friend, Darwin Poulos, on the darkness of the sky. He was now observing with his 8-inch reflector about 20 yards from me, examining objects in the Southern Milky Way. He was having a good night too. As I continued to sweep I observed a faint galaxy known as NGC 185, moving over a field I also examined NGC 147. Because of the lights of San Jose, I do not often see these two objects from my site at Loma Prieta. But they were easily visible from here. On the next sweep, I saw the majestic Andromeda galaxy; it more than filled my field of view. But I could not gaze for long, I had to keep sweeping, and dawn was approaching. About three sweeps later, at 4:13 a.m., I picked up a fuzzy object, not too faint, which suddenly aroused my suspicion. It was a part of the sky where I knew there were no galaxies or clusters, and it appeared pearly white, like a comet. I stopped my sweeping and started my work of determining the nature of the object. Foremost, I had to know exactly where my telescope was pointed. This is needed for two reasons. First, to check my charts to see if the Skalnate Pleso Atlas of the Heavens chart showed no known objects and I plotted a small pencil mark at its position on the map. Next, I had to check for motion. A comet will move against the background stars, so I drew a map and hoped to detect movement. Meanwhile, I made a quick measurement of its position and checked my more extensive catalog. It did not list any known object in that position. 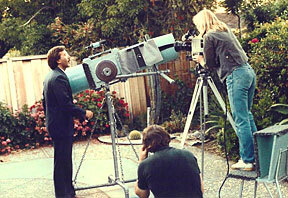 Don Machholz films a piece with a KPIX Channel 5 news team in his backyard. With dawn nearly upon us, I made a few more checks. 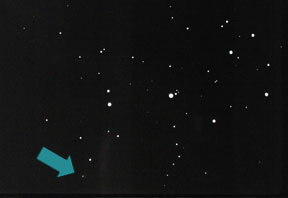 A Barlow lens, doubling the magnification, showed the object to be fuzzy and elongated, and not a small group of stars. Next, I tried a “Comet Filter” (with it some comets will appear more visible as the background is darkened. Any other object will appear fainter). This object was more visible. By now it was difficult to see the object, as the sky was rapidly brightening. Furthermore, I had not detected movement. The 27-degree temperature was nipping at my hands because I had removed my gloves when I spotted the object some 20 minutes earlier. I felt quite sure that I had discovered a comet, and yet the lack of motion prevented me from being absolutely certain. I had searched 1742 hours since my first comet find. I went to the truck and woke up Laura. “Laura”, I said, “I think I found a comet.” She woke up immediately. Reporting the comet was nearly as hard as finding it. I merely had to call the Smithsonian Astrophysical Observatory in Cambridge, Mass., the clearing house for comet discoveries. We knew of only one phone at the camp, a pay phone at Coombs Lodge. After writing up the telegram and walking a quarter-mile to the phone, I had trouble getting through to the operator. The phone finally jammed and we had to move on. We tried looking for a few of the comet hunters there but at 5 a.m., they could not be found. Perhaps they would know of any known periodic comets in that area of the sky. Or, perhaps they would know of a recent discovery in this region. I could hardly believe that a bright comet of magnitude 9.3 would still be undiscovered. Unable to find anyone, we had no choice but to pack up and go to our motel in Big Bear City, ten miles away. 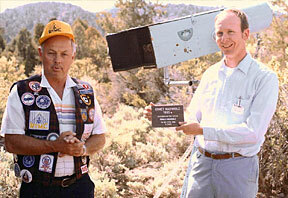 Don Machholz receives a plaque from Cliff Holmes, left, to mark the site in Camp Oaks, Ca, where Don discovered Machholz 1985e. Following an hour of telescope disassembly, Darwin’s car occasionally quitting, and a hurried drive, we arrived at the Motel 6 lobby. Our luck was unchanged. The Western Union, which would send the telegram to the Smithsonian, was not answering the phones. Meanwhile, this being a holiday, no one was at the Smithsonian Astrophysical Observatory to take the discovery message. I tried to call the Smithsonian director, Dr. Brian Marsden, at home, but his number was not listed. Suddenly, among my notes, Laura found his home phone number. I tried it. Dr. Marsden said he had no reports of a comet being found, and we could not recall any known periodic comets in the region. He took my message and said he’ll try to get someone to confirm that this was indeed a new comet. I said I’ll try to do the same. Then it was back to our rooms for a quick shower, packing and then out to breakfast. Our nine-hour drive home brought us from the clear morning skies of Big Bear to the cloudy evening skies of San Jose. Upon arriving home I called Gerry Rattley of Phoenix, Arizona, Jack Marling of Livermore, California, and the observers at nearby Lick Observatory, asking them to observe the object and confirm it. The next morning saw Rich Page, Laura and me on Loma Prieta, sitting in the clouds. Finally, it began to clear, and near 3:30 a.m., we set up our telescopes and began to search. After a few minutes, I found it one and one-half degrees ENE of the previous day’s position. It was a comet! Rich then found it too, and we showed it to Laura. We all were happy! In this Lowell Observatory photo, Comet Machholz 1985e makes its way past M45. Meanwhile, Charles Morris and Alan Hale of the Los Angeles area had received word from the Smithsonian Astrophysical Observatory via Stephen Edberg of my possible discovery. Following only a few hours of sleep, they went to a nearby observing site and confirmed the existence of the comet. A preliminary orbit shows the comet will be nearest the sun on June 8, 1985, at a distance of only 10 million miles. Until June 15 it should continue to brighten in the morning sky, and then we will lose it in the solar glare. About July 10 it will emerge into our evening sky, then fade rapidly. According to my recent study A Decade of Comets, I found that none of the comets found by amateurs during the past decade came as close to the sun as this comet. And, while this might be one of the brightest comets in several years, for much of the time it will be too close to the sun for easy observation from earth.